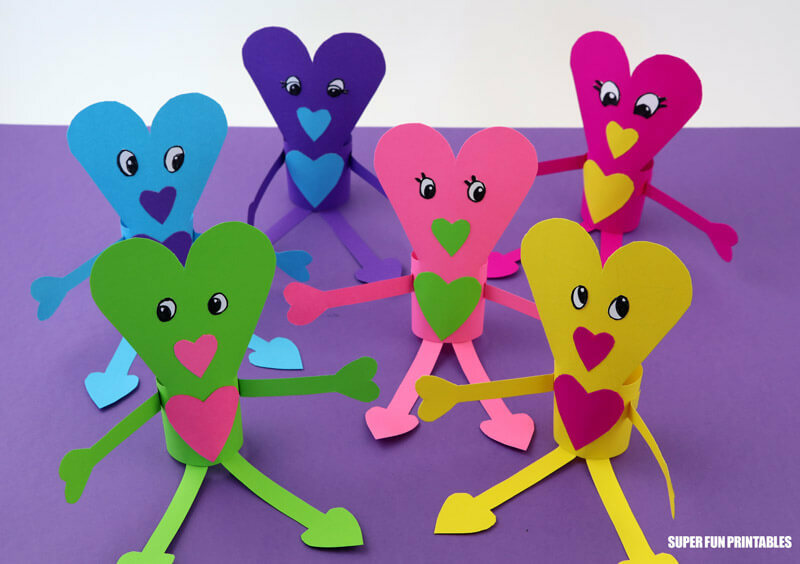 These paper heart people are a cute Valentines Day craft idea for kids. You can make them for yourself or to give one to somebody special. Do you know someone who needs cheering up? Never fear, the paper heart people are here! They mighty be a bit funny looking, but they have a great big heart and they’re here to spread their love and happy vibes around. They say the eyes are the window to the soul, and this is also true with paper heart people. Each one has their own unique personality shining through their black and white cartoon eyes. I have drawn the eyes on these ones with a felt tip pen but I have also created a printable sheet of eyes which you can cut out and stick on if you’d rather not draw your own. 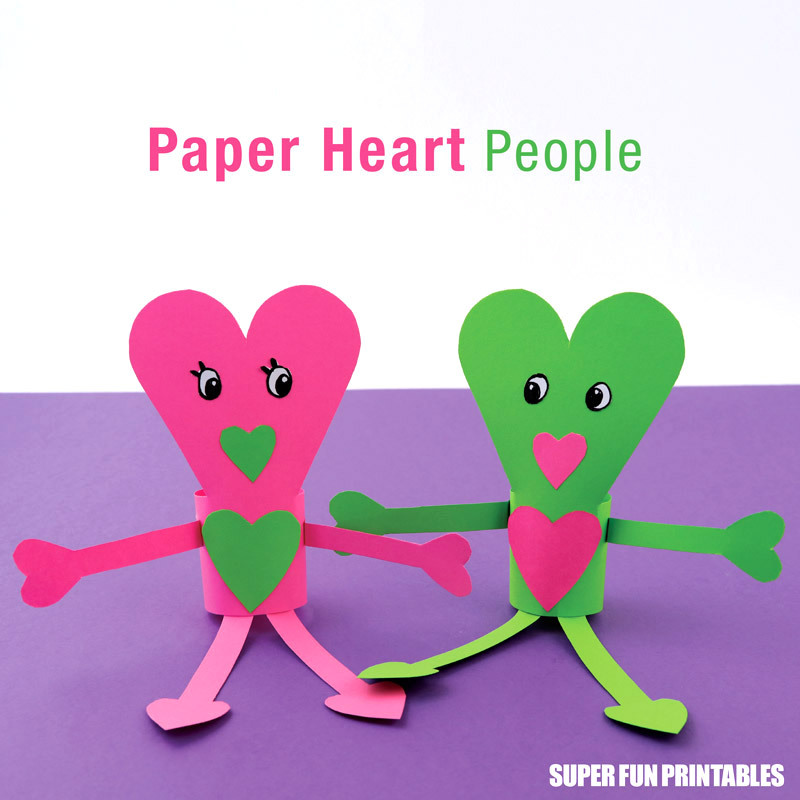 One thing you should know about paper heart people is that they love company and will get very, very lonely if they have nobody to be with. For this reason the instructions give you enough pieces to create two paper heart people at once. Want to make one? 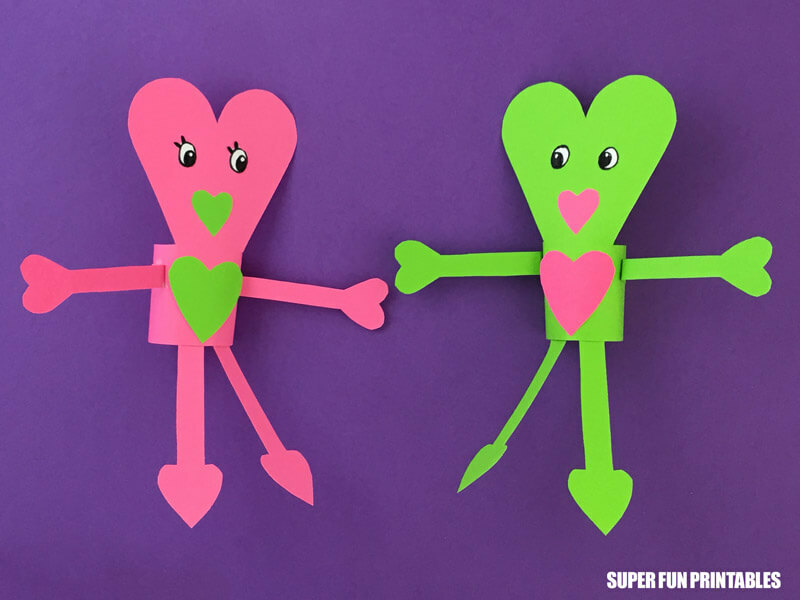 They are super easy to put together with the template from our Super Fun Printables store and some coloured construction paper. You will also need a glue stick and stapler. Staple the template directly over the top of the two sheets of construction paper, one staple in each corner. Cut the shapes out. Separate the white shapes from the coloured shapes and lay the coloured shapes out. 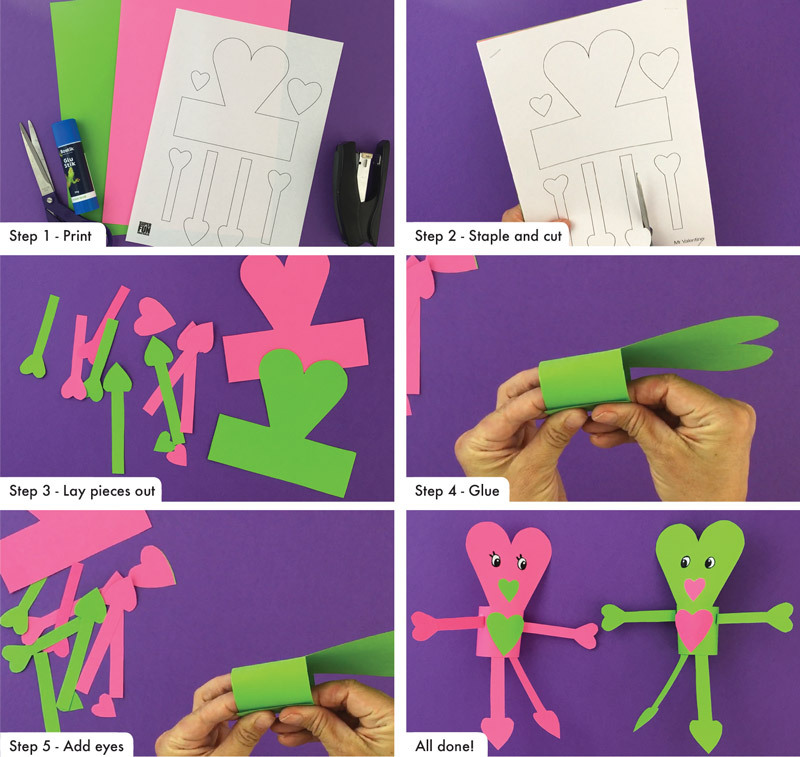 Select a body shape and glue it together at the back, then glue on the matching legs and arms. Select the heart shaped mouth and tummy in the alternate colour and glue into place. Choose a set of eyes from the template (or draw your own with black felt-tip pen) and cut them out to glue on. 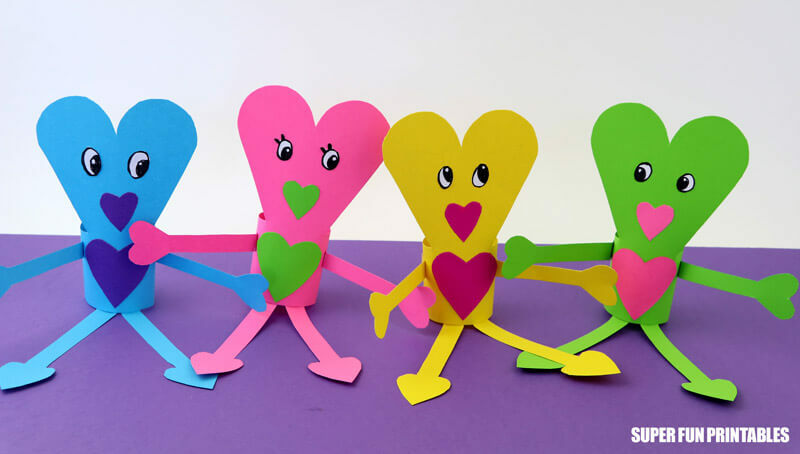 There should be the exact amount of pieces left to put together a paper heart person in the opposite colours so the first one has a friend to keep it company. If you know anybody who is feeling a bit down give them a paper heart person. It’s their mission in life to make people smile. 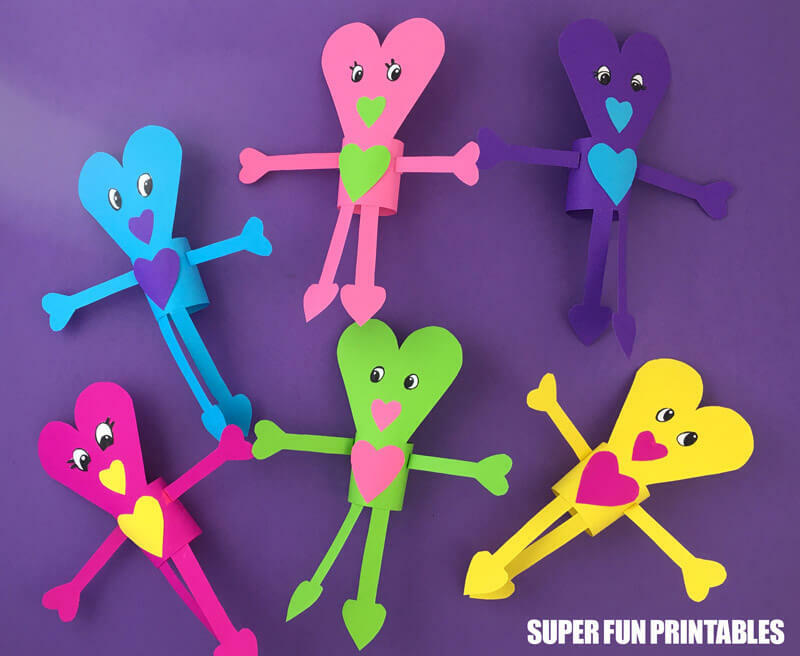 • These paper roll love bugs are so adorable!